Many students may think that once they’re out of college, they will never have to see a classroom again, because that’s not in their career. For people like Jay Hildebrandt, that isn’t the case. 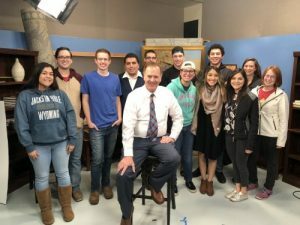 Hildebrandt currently works at the Local News 8 station and as a professor at BYU-Idaho. The two environments are very different, particularly that in one, he is standing in front of a class giving a lecture, and in the other, he’s working and doing his usual job. He said on campus is more spiritual than the businesslike workplace. Working in both, however, gives him the best of both worlds. When he teaches students the same principles all the time, he said it makes him better at his job. “I am constantly teaching things that I should be doing anyway, but it reinforces them,” Hildebrandt said. Then, when he brings students to the studio where he works, they bring an enthusiasm for the career with them. He said they see it as an exciting place, almost like a behind-the-scenes set of Hollywood. “It makes us remember why we went into this business,” Hildebrandt said. 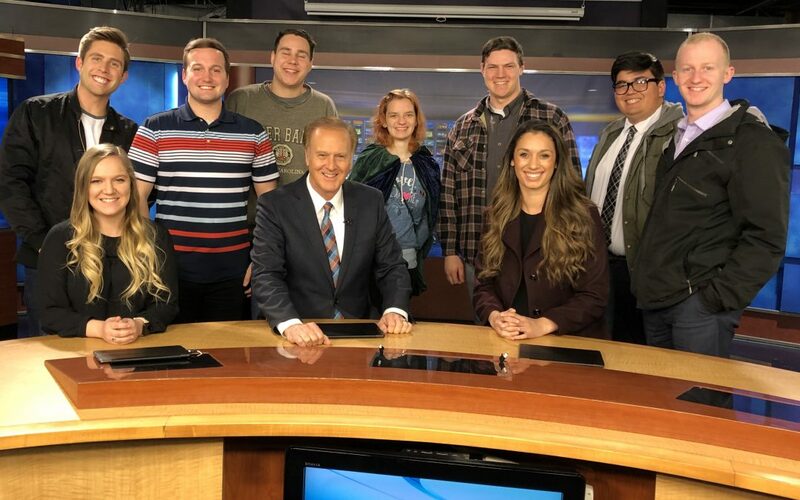 His co-anchor, Karole Honas, agreed that having the students come to watch a show was refreshing. She has been his partner at the studio desk for 29 years, so she knows him — and his students — very well. She continued to explain that not only is it nice to see the enthusiasm of the students, but his teaching helps him keep up to date too. 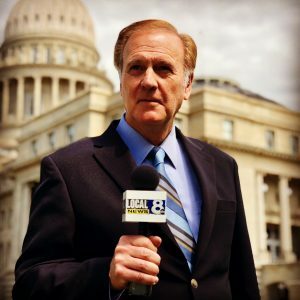 With the changing world of technology, Honas said “he can bring back the feedback from the young people,” explaining what forms of the news they use the most. Since Hildebrandt works in both the studio and classroom, he gets to refer students to the studio. For the last 10 years, they’ve always had one of his students at the station, often as an intern. Hildebrandt is not the only one who has been both a teacher and a normal employee before. Brent Morring, a math professor who started teaching after he left the general workforce, has also had experiences with both worlds. Morring said the main thing that’s different between the two environments is where his satisfaction comes from. He said more of his satisfaction in the workplace came from what he was working toward and accomplished. He said that the concepts he teaches in math may not be directly used in everyone’s career, but “it’s not too hard to show students how it’s relevant.” Morring said math can teach problem solving, build determination and develop confidence. All of these skills are important for any work environment. “It’s a career, not just a job,” Hildebrandt said. Working in the field is a hard task that requires keeping up with deadlines, a concept that students have to deal with all the time. Turns out the workforce and the classroom are very similar and beneficial to each other in many ways, both for teacher and student.